I've discussed before that the missing piece to my Batman collection is the 1966 TV series Batmobile. I have seen different versions of the caped crusaders cruiser at many auto shows, but I would love to have a chance to at actually sit in one not mention own one. The good news is I could actually pick up an exact replica of one these babies from Fiberglass Freaks. 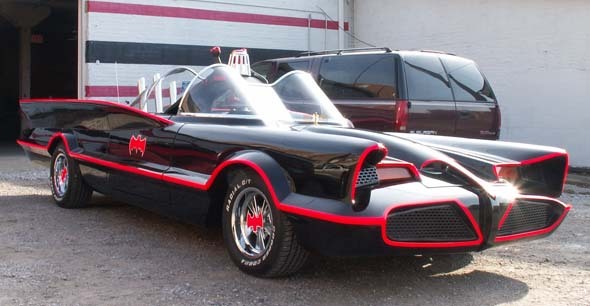 Mark Racop, owner of Fiberglass Freaks, has been making replica's of one the most recognizable cars in the world for the past few years, but now he has been officially licensed by DC Comics to produce replicas of the TV series that starred Adam West. Mark's 1966 Batmobile's have a six month build out and are sold for $150,000. They ask for a $50,000 deposit, $50,000 when the body is mounted to the chassis, $30,000 when the car is in first prime, $15,000 when the car is painted, and the balance of $5,000 upon completion. Now all I have to do is get the money together to order one of these Super Elite vehicles. Anyone want to contribute to my Batmobile fund? Hey, cool site!! I happened upon it off a link off another toy site from Saruman and since Batman is at the top of my short list of fave toys, I will be checking it out often! Hey, Super-Duper Toybox, I'd love to pick up a couple these babies. I actually want to get at least one for my business and rent them for events and promotions.